Category: A Local Brand or Service in a Local Market with innovative media solutions worthy of international adaptation or of world class standards. Isabelle Rondeau , Director, Communications, Public Affairs, Bombardier Inc. The Situation: Bombardier is a world class, Canadian transportation company, the largest supplier of rail equipment, systems and services and the third largest manufacturer of civil aircraft in the world. Although Bombardier has numerous global engineering accomplishments to its credit, the Canadian media often portray the firm in a negative light, due to the involvement of Canadian Government loan guarantees in the aeronautical bidding process. A natural for the size and scale of Olympic Sponsor Status? Perhaps not. It depends how you look at the Olympic opportunity. Insight and Strategic Approach: Bombardier and the Olympic movement share the same ideals – vision, drive, a passion for excellence, a commitment to training and development and technical skill which is all tested on the world stage against the greatest competition the world has to offer. But although the parallels were quite evident, and Bombardier could benefit from the brand synergy of the opportunity, that foundation wasn’t enough for us to ante up millions of Bombardier’s (very) limited marketing dollars into one premium, cluttered, commercial marketing venture. That is until we came up with an idea that connected the engineering excellence of Bombardier to the heart of the Canadian Olympic movement for the 2010 games. The Olympic Torch is the most powerful and unifying symbol of the Olympic Games. Our idea was to convince Bombardier to bid to become the first Olympic Sponsor to design and manufacture the Olympic Torch. The engineering excellence put forth in the creation of the torch to handle all Canadian weather possibilities could be used as a metaphor for Bombardier’s overall engineering and manufacturing excellence. As the torch was carried across this vast country, Bombardier would be at the heart of igniting Olympic pride in one Canadian community at a time. Media Tactics: The first part of our two-phase engagement strategy started in October to connect Bombardier with the Olympic movement prior to the Olympic frenzy. We capitalized on the Canadian journey of the Bombardier torch by linking Bombardier and the Torch through a massive public relations campaign. The torch was ignited on October 30th 2010 in Victoria B.C. commencing a 106 day relay ending in Vancouver on February 12th 2010. Over 12,000 Canadians carried the torch on its longest journey in Olympic history, at 45,000 kilometers. The torch traveled through 1,037 communities in snow, rain, hail, wind and sub-zero temperatures, showcasing Bombardier’s engineering capabilities to millions. Local and national media carried the story of Bombardier’s design and manufacturing excellence as the torch traversed the country. 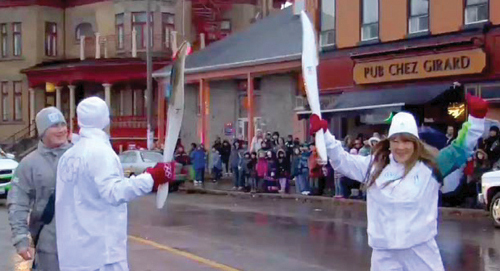 In addition, CTV produced and broadcast nationally, two special programs focusing on Bombardier’s central role in its design and manufacture throughout the torch relay. Social media sites were all a Twitter with torch relay news. Every time users mentioned the torch online they were invited to Bombardier’s YouTube channel to view an extended version of the TV creative. The second phase of our strategy utilized the power and emotion of the games themselves through a television commercial that further connected the story of the creation of the torch with Canadians. The commercial ran in key highly emotional and highly rated moments such as opening ceremonies, just after the arrival of the Canadian team and just before the arrival of the torch in the stadium, during women’s and men’s gold hockey games. The most significant, memorable Olympic connection-- the Olympic Torch relay-- is an emotional and unifying focal point for public interest which serves as a countdown to the opening ceremonies of the summer and winter Games. Leveraging the enormous multi-channel coverage and generated word of mouth surrounding it convincingly cemented the association between Bombardier, the Olympic Spirit and Canadian pride. Results: Following the games, the annual CROP survey on the image and reputation of the Bombardier brand reported a major upswing in public opinion. Canadians with a very favorable opinion of Bombardier grew by 28%, climbing to 32% in 2010. This unique idea from the media team generated media value at a ratio of 5 to 1 of non paid - paid media.